The first sighting of local strawberries is a harbinger of spring. 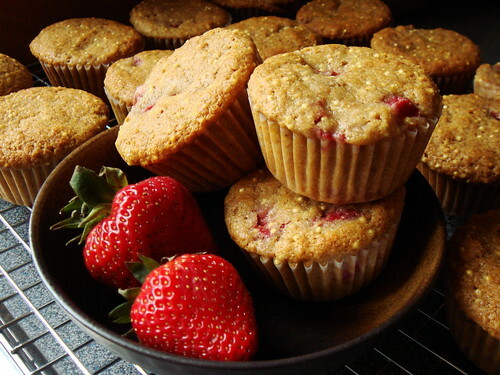 I would love to tell you that these Strawberry Honey Millet Muffins are made with local Ontario strawberries and we’re enjoying some nice warm weather. Alas, I can’t. We had sleet and hail in late April and the only thing I’m glad is that I haven’t switch out my snow tires yet. Traveling to Tampa and Austin in the last few weeks had me envious of their local strawberries. Though I took advantage of enjoying the little sweet jewels, it’s just not the same as home. Spring, kick old man winter out the door soon please please please? Inspirations can come at the oddest hour. I woke up at 4am last night and couldn’t fall asleep. Of course, I started flipping through cookbooks. The Millet Muffin recipe from Heidi Swanson’s Super Natural Everyday caught my attention early on when I received the cookbook in the mail. I love the crunchiness millet adds to baked goods. 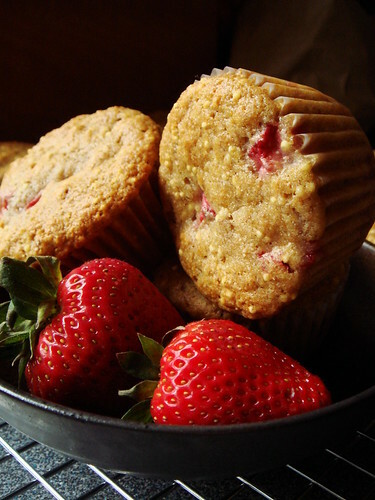 When I read the recipe last night, the roasted strawberries serving suggestion seemed like the best idea in the world and I decided that I must make these muffins next morning with chopped strawberries in the batter. I take my words seriously so here they are. Strawberries are rarely baked into cakes or cookies probably because they are too moist. I chopped the, ahem, California strawberries into dices and folded them into the muffin batter just before baking. The batter itself is a close adaptation of Swanson’s recipe to accommodate ingredients I have available. Whole wheat pastry flour was replaced with a blend of hard whole wheat and all-purpose flour (a logical substitution I learned from Kim Boyce’s Good To The Grain). Yogurt was replaced with equal volume of buttermilk to cut down a little on fat content. With the added fruit, the recipe yields 16 regular size muffins. The lightly honey-sweetened muffins are wonder as part of brunch or breakfast on-the-go. Here’s to the eventual arrival of spring! A note about these photos: I can’t believe they are straight-out-of-camera. When I took the pictures, it was overcast and raining outside all morning. I thought for sure there wasn’t enough natural light but everything turned out just fine. In fact, the light was not as harsh as a sunny day. So much I have yet to learn. Preheat oven to 400F. Line muffin tin with paper liners. In a large mixing bowl, whisk together dry ingredients including whole wheat flour, all-purpose flour, baking powder, baking soda, salt, and lemon zest. In a medium mixing bowl, whisk together wet ingredients including buttermilk, melted butter, honey, and eggs. Pour wet ingredients into dry ingredient and stir just enough to combine. Fold in diced strawberries. Fill muffin tin with batter, about 1/4 cup per indentation. Bake for 20-25 minutes until golden on top and cake tester comes out clean. Cool in tin for about 5 minutes before removing to cooling rack. Best served the same day they are baked.